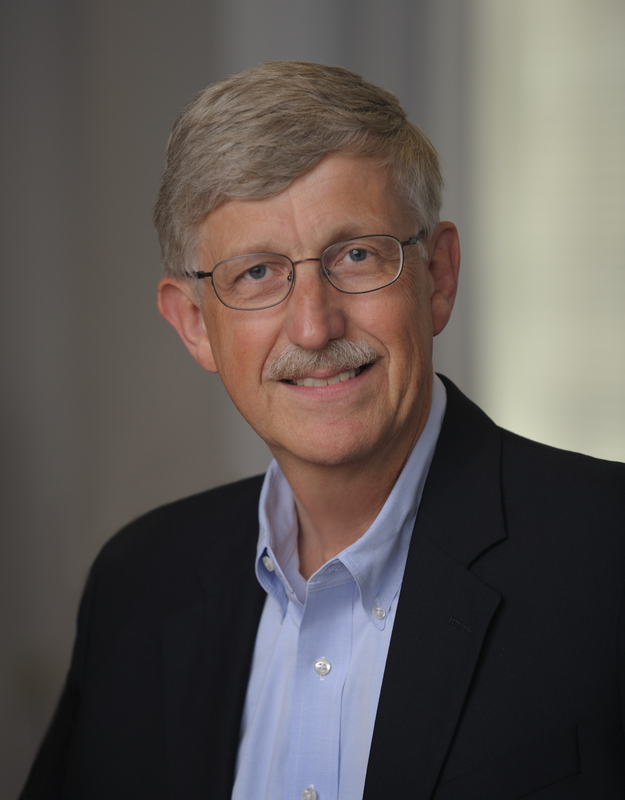 NIH Director Dr. Francis Collins, and author and science journalist Ed Yong host a Facebook Live at the National Institutes of Health to talk about the world of microbes that exist within and around us, and their potential impact on the future of biomedical research. U.S. 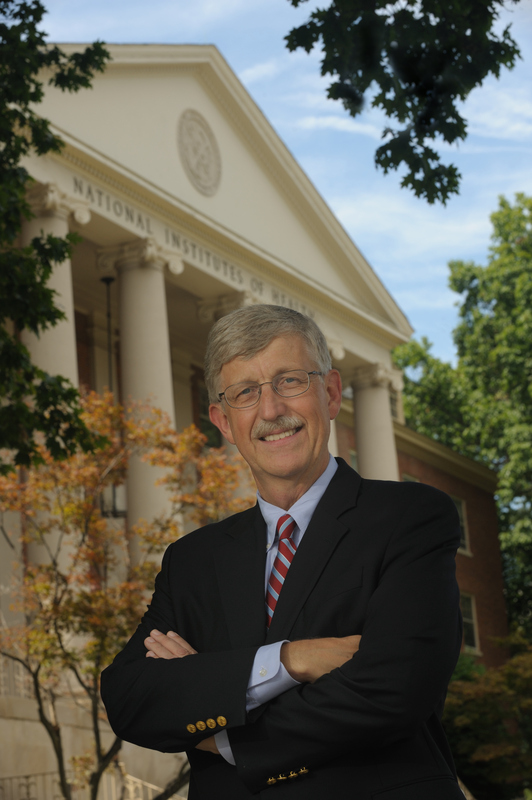 Surgeon General Dr. Jerome Adams chats with NIH Director Dr. Francis Collins on the HEAL Initiative, pain research, and the opioid crisis at the 13th Annual NIH Pain Consortium. 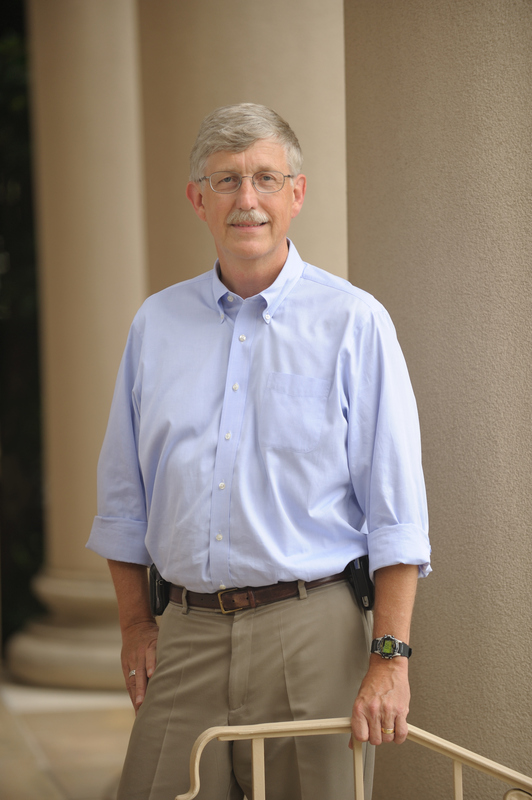 NIH Director Dr. Francis Collins participates in Bike to Work Day to help show the importance of physical activity. 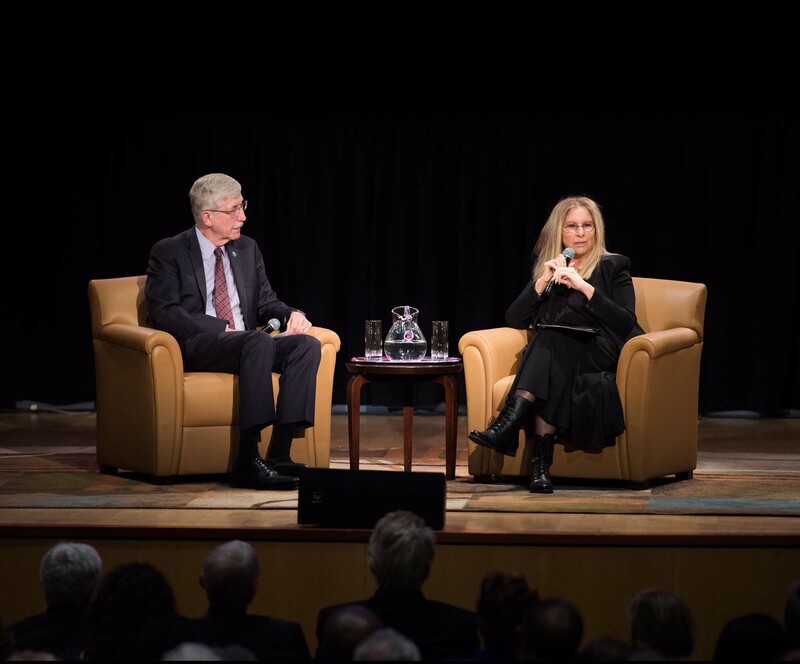 EGOT winner and Women’s Heart Alliance Co-Founder Barbra Streisand and NIH Director Dr. Francis Collins host a chat to discuss translational science, healthy equity, and women’s heart health at the National Institutes of Health. 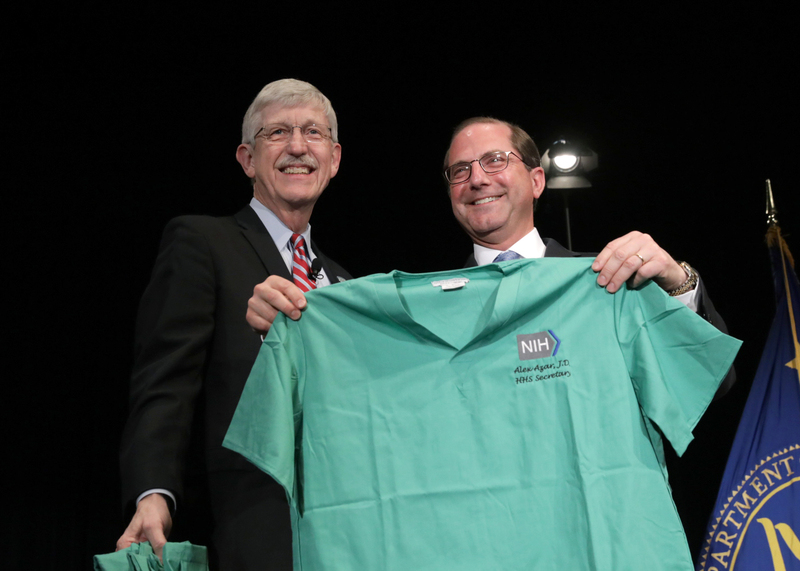 HHS Secretary Alex Azar has his first official visit to NIH to host a town hall, and get an update on the latest NIH research including a tour of NIH research on pain and how it relates to the opioids crisis. 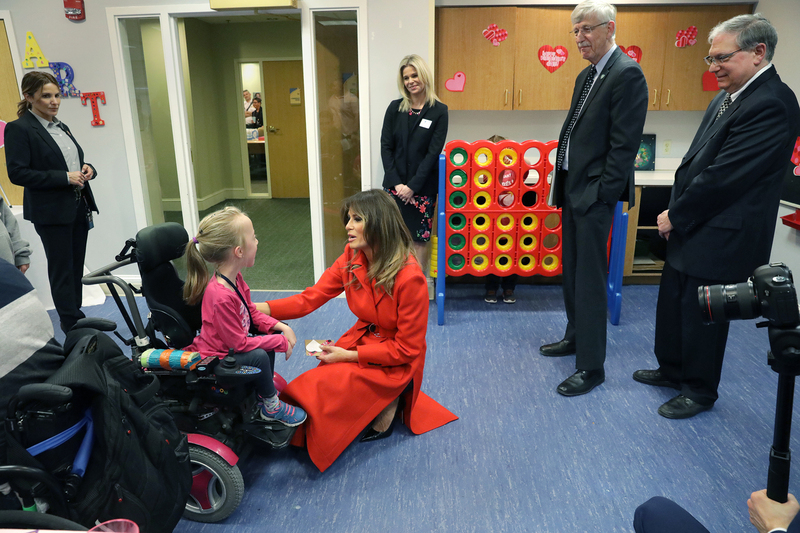 The First Lady of the United States Melanie Trump tours The Children’s Inn (TCI) at the NIH with TCI CEO Jennie Lucca, NIH Director Dr. Francis Collins, and NIH Principal Deputy Director Dr. Lawrence Tabak. The Children’s Inn is a place like home for children undergoing clinical trials at the NIH Clinical Center. 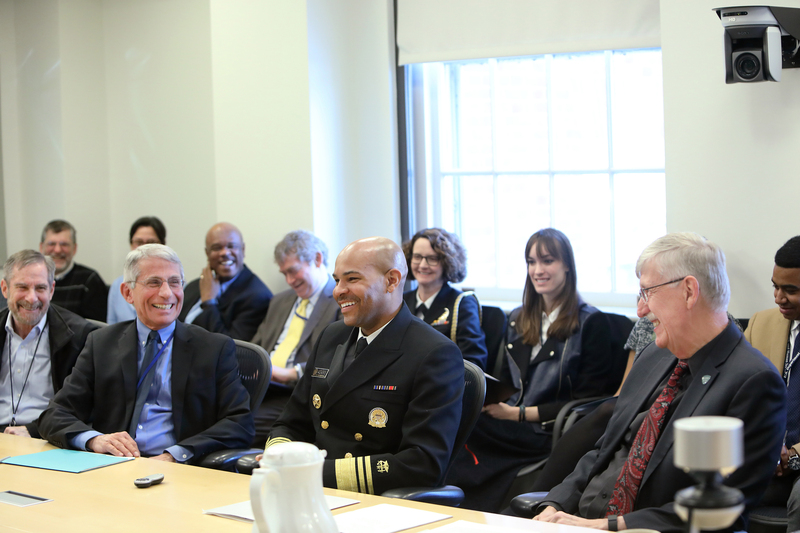 US Surgeon General Vice Admiral Jerome M. Adams visits NIH to discuss ways to make America healthier and combat addiction. 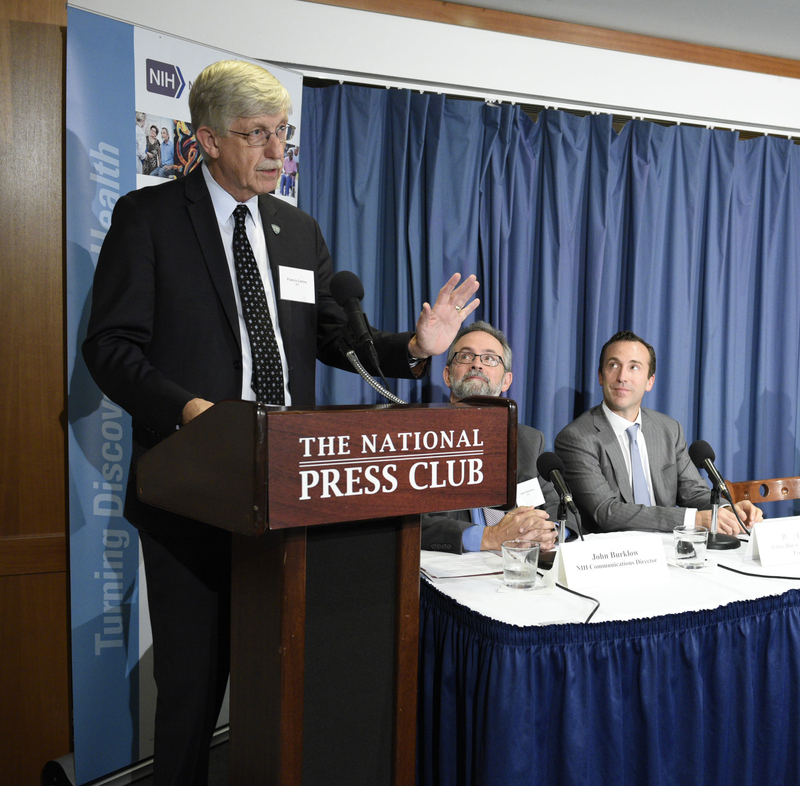 From left to right: National Cancer Institute Deputy Director Dr. Doug Lowy, National Institute of Allergy and Infectious Diseases Director Dr. Antony Fauci, Surgeon General Jerome Adams, and NIH Director Dr. Francis Collins. 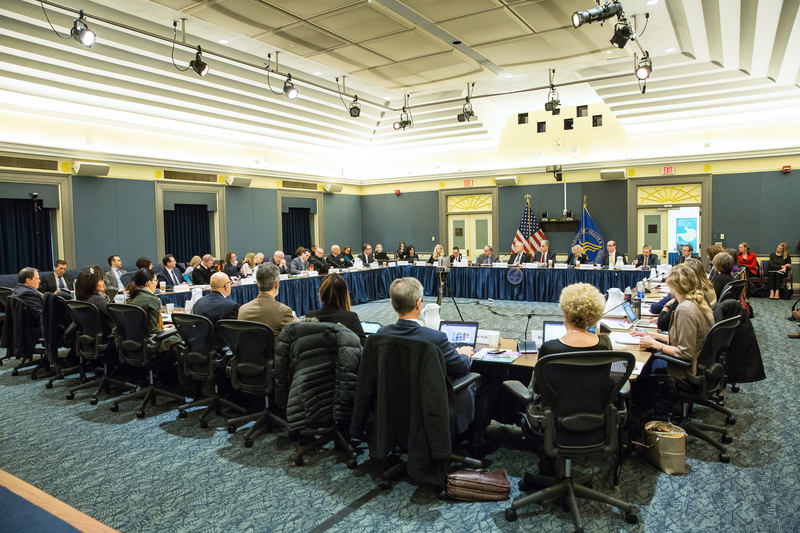 HHS Acting Secretary Eric Hargan, NIH Director Dr. Francis Collins, and other leaders in the private and public sector join to identify and address high-priority research gaps to ensure an evidence-based approach to combat the opioids crisis. 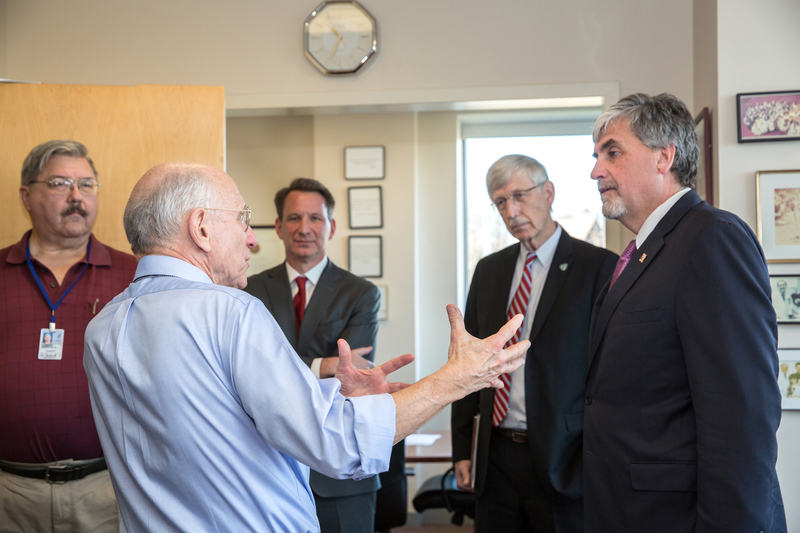 NIH Director Dr. Francis Collins hosts Acting Health and Human Services (HHS) Secretary Eric Hargan on an NIH tour, including a stop in Dr. Steve Rosenburg’s immunotherapy lab (pictured here) in the NIH Clinical Center. 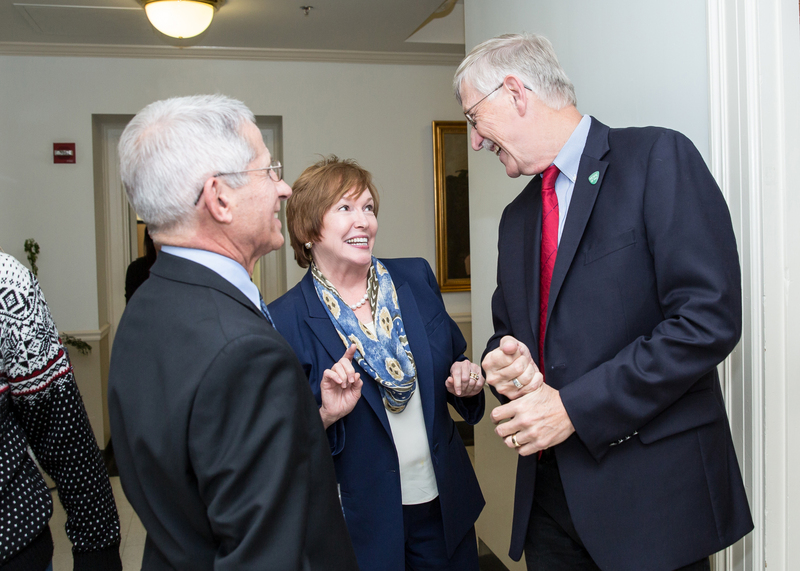 Centers for Disease Control and Prevention (CDC) Director Dr. Brenda Fitzgerald meets with NIH Director Dr. Francis Collins and NIH’s National Institute of Allergies and Infectious Diseases Director Dr. Anthony Fauci during her first official visit to NIH to discuss ongoing collaborations. 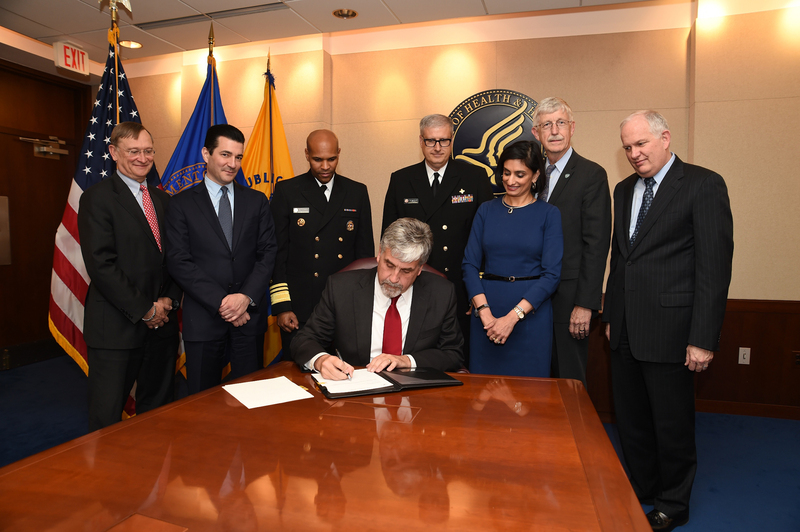 Acting Health and Human Services (HHS) Secretary Eric D. Hargan signs the declaration of a nationwide public health emergency on the opioid crisis, as requested by the President. 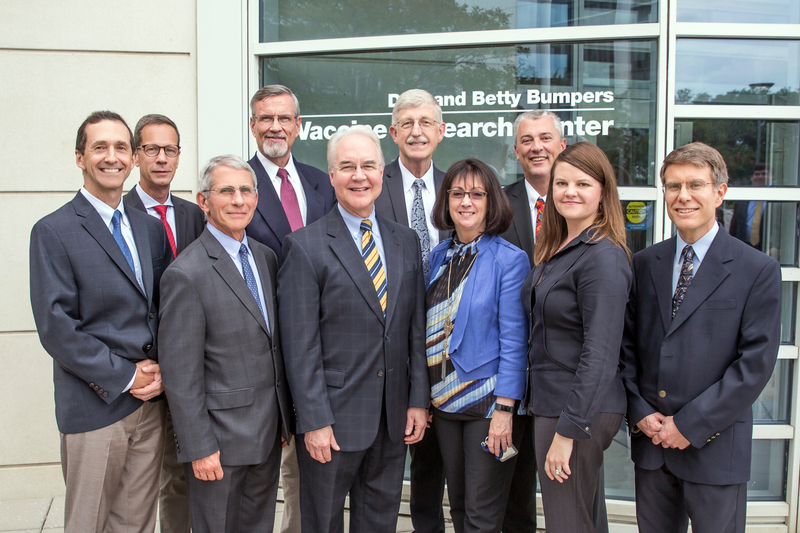 Standing from left to right: Assistant Secretary for Preparedness and Response Robert Kadlec, FDA Commissioner Scott Gottlieb, Surgeon General Jerome Adams, IHS Chief Medical Officer Michael Toedt, CMS Administrator Seema Verma, and NIH Director Francis Collins. Seated: HHS Acting Secretary Eric Hargan. 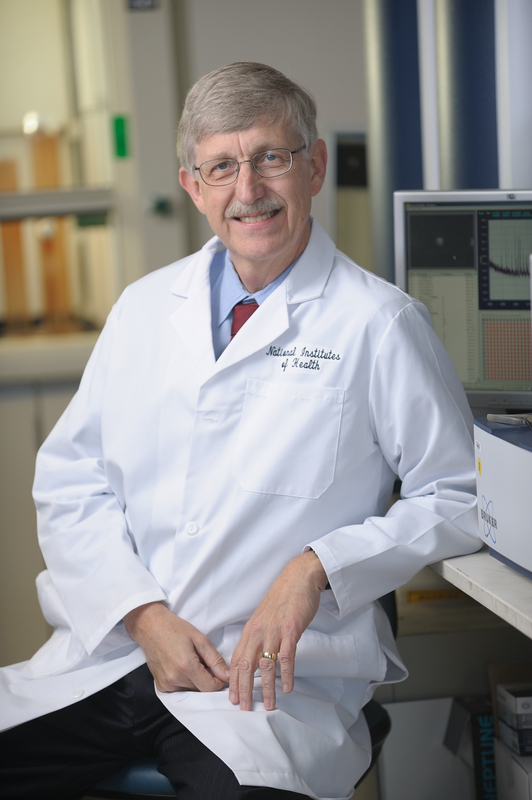 NIH Director Dr. Francis Collins speaks at a press conference to announce the Partnership for Accelerating Cancer Therapies (PACT), a five-year public-private research collaboration totaling $215 million as part of the Cancer Moonshot. 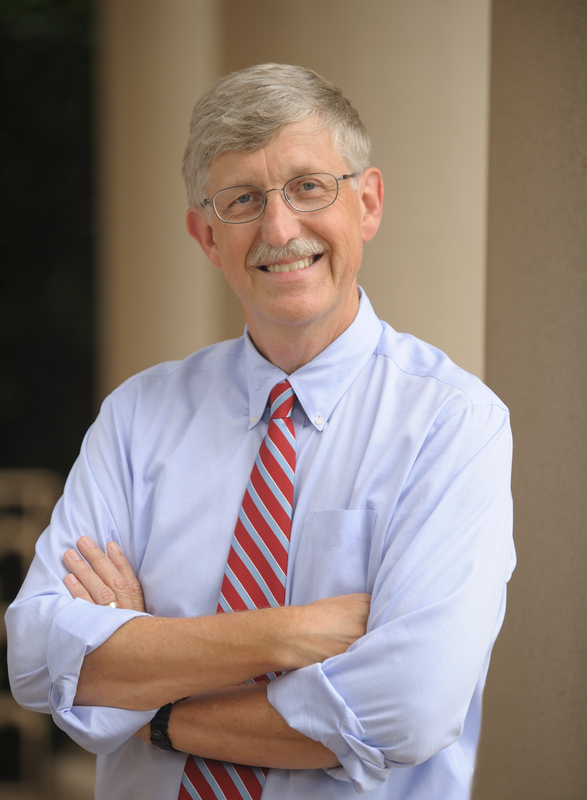 NIH Director Dr. Francis Collins honors the late Rep. Louis Stokes’ work in health disparities research by hosting his family and colleagues at NIH. 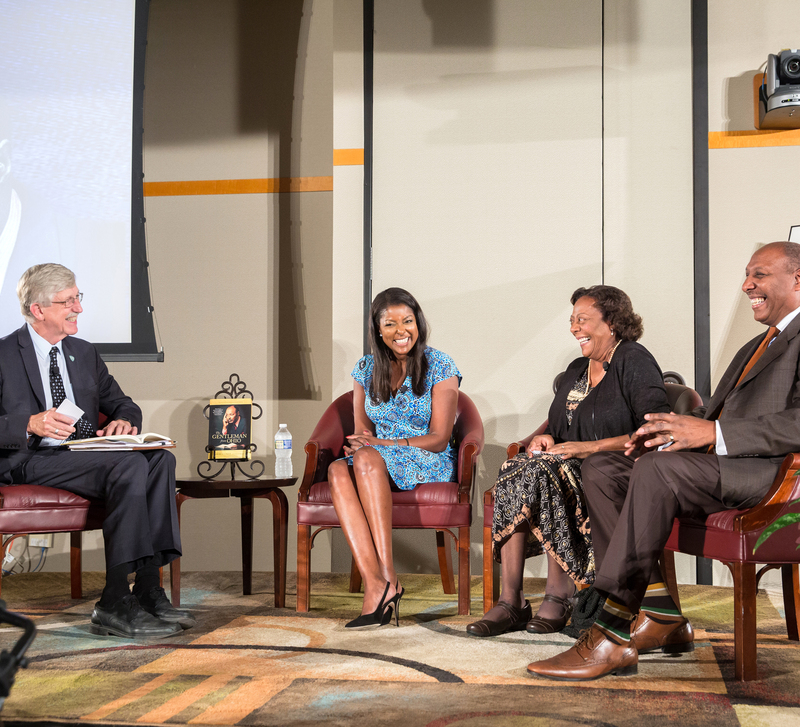 (L-R) Francis S. Collins (Director, NIH), Lori Stokes (Louis Stokes’ daughter), Shelly Stokes Hammond (Louis Stokes’ daughter), and Chuck Stokes (Louis Stokes’ son). 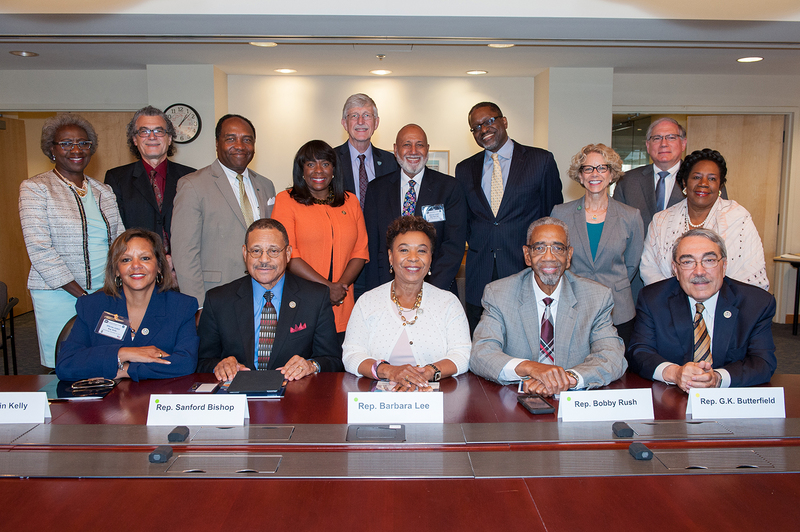 NIH Director Dr. Francis Collins welcomed the Congressional Black Caucus to the NIH to talk about the importance of health disparities research and workforce diversity. Standing from left to right: Hannah Valantine, Eliseo Perez-Stable, Griffin Rodgers, Terri Sewell (D-AL), Francis Collins, Alcee Hastings (D-FL), Gary Gibbons, Diana Bianchi, Lawrence Tabak, Shelia Jackson Lee (D-TX). Seated from left to right: Robin Kelly (D-IL), Sanford Bishop (D-GA), Barbara Lee (D-CA), Bobby Rush (D-IL), G.K. Butterfield (D-NC). 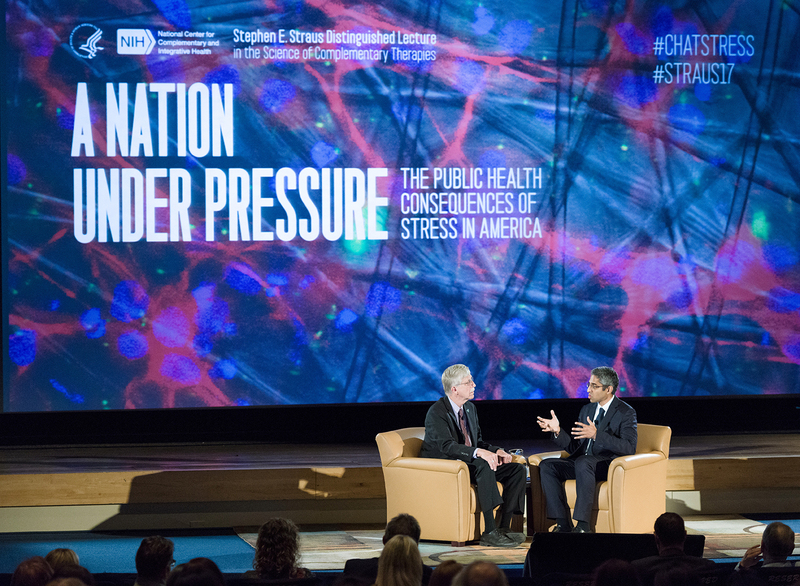 Former Surgeon General Dr. Vivek Murthy and NIH Director Dr. Francis Collins hosted the 2017 Stephen E. Straus Distinguished Lecture on “A Nation Under Pressure: The Public Health Consequences of Stress in America”. 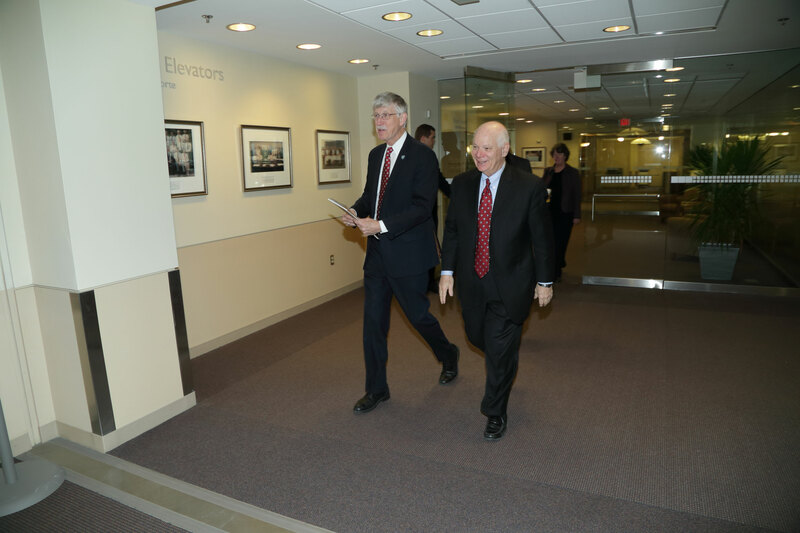 HHS Secretary Price tours the Vaccine Research Center on the NIH campus, Bethesda, Md., with NIH Director Dr. Francis Collins, NIAID Director Dr. Anthony Fauci, and staff from HHS and the NIH. 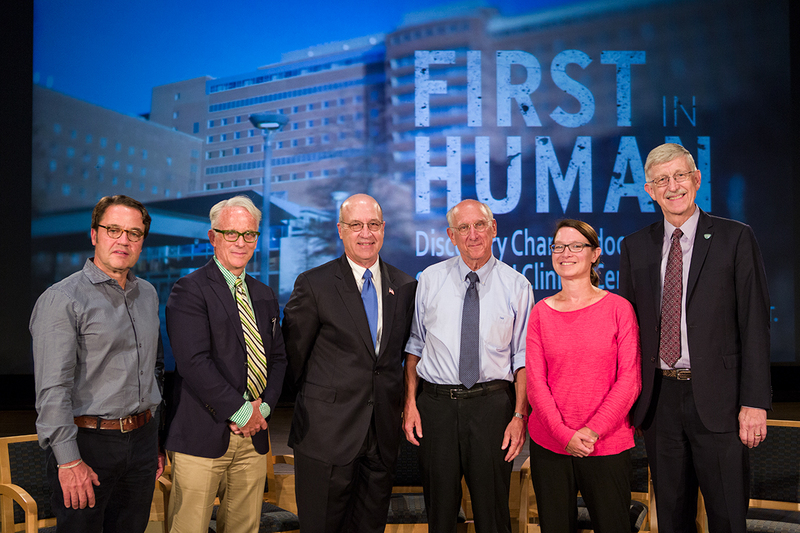 NIH hosted a screening for NIH employees of Discovery’s documentary on the NIH Clinical Center, called First in Human, and held a panel discussion with people featured in the documentary. 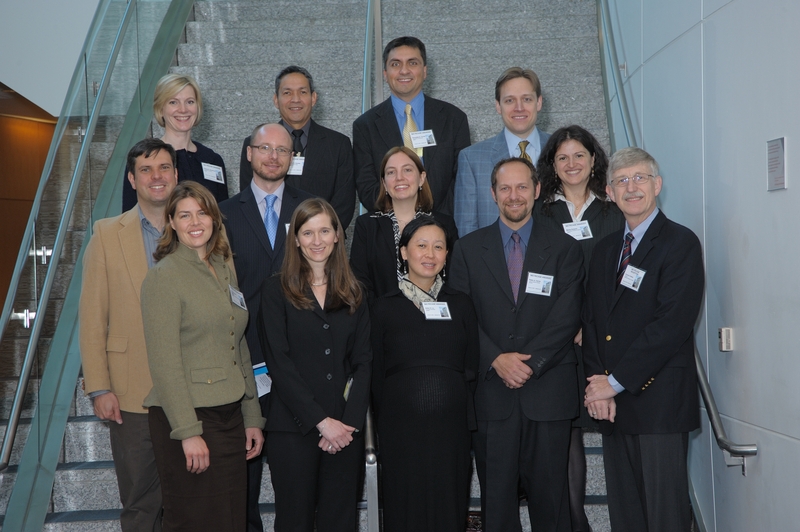 L-R: NHLBI/NIDDK researcher Dr. John Tisdale, Producer and Director John Hoffman, NIH Clinical Center CEO Dr. James Gilman, NCI researcher Dr. Steven Rosenberg, NIAID researcher Dr. Alexandra Freeman, and NIH Director Dr. Francis Collins. 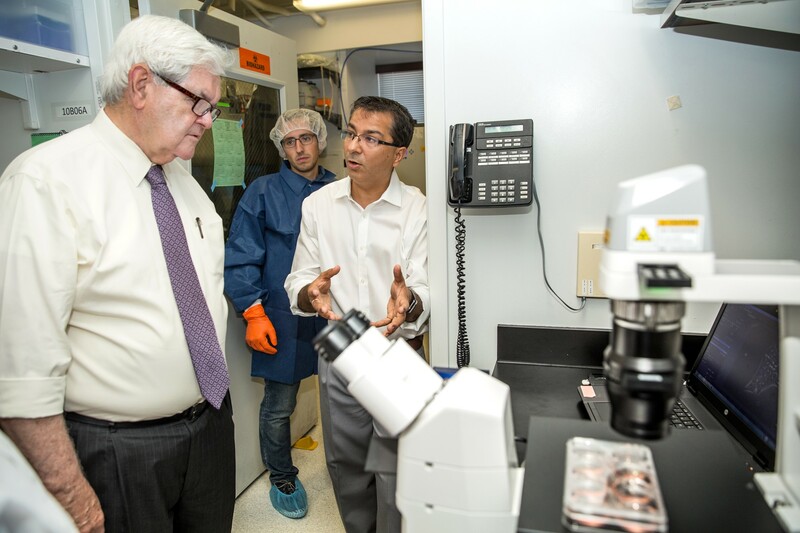 Former Speaker of the U.S. House of Representatives Newt Gingrich tours Dr. Kapil Bharti’s lab at the National Institutes of Health. 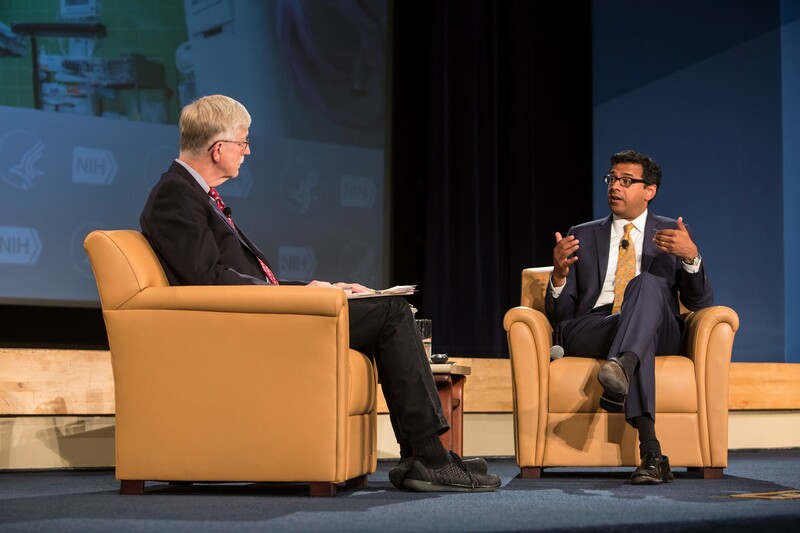 National Institutes of Health Director Dr. Francis Collins and researcher, surgeon, and best-selling author Dr. Atul Gawande hosted a Facebook Live Q&A to talk about systems science and innovations in healthcare delivery. 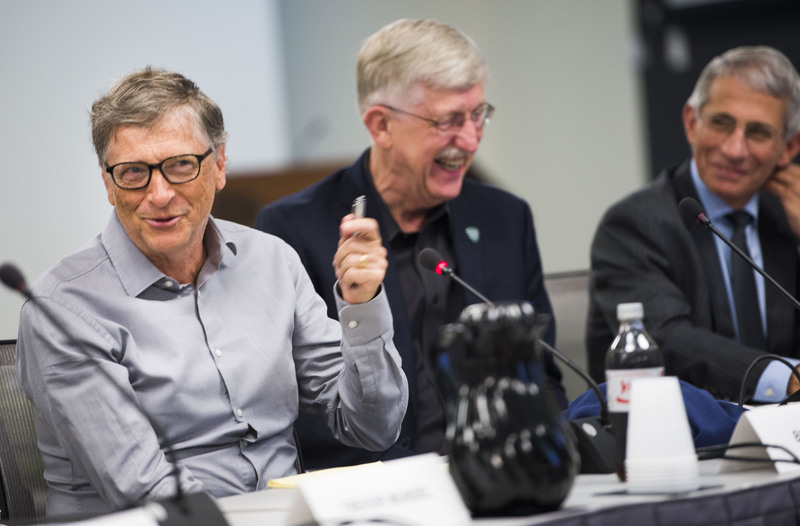 National Institutes of Health Director Dr. Francis Collins and National Institute of Allergy and Infectious Diseases Director Dr. Anthony Fauci meet with Bill Gates of the Bill and Melinda Gates Foundation at NIH to discuss research opportunities in global health. 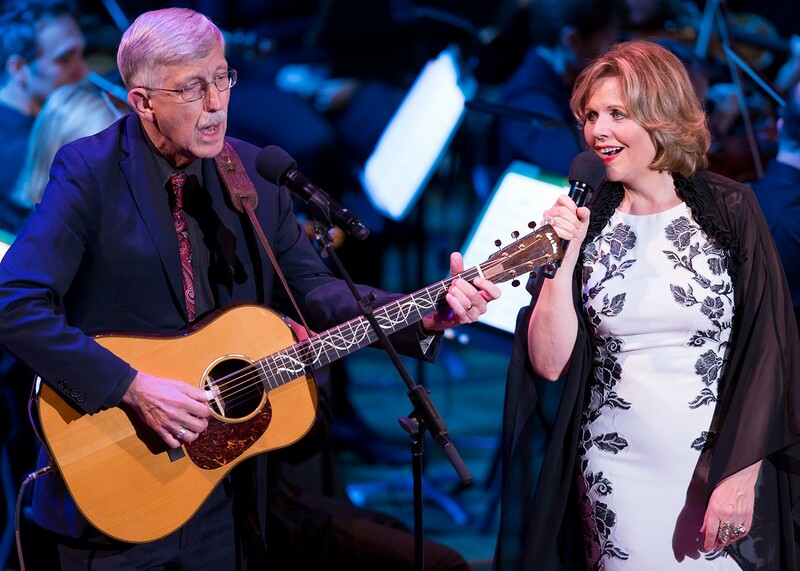 National Institutes of Health Director Dr. Francis Collins performs with opera singer Renee Fleming during Sound Health Music and Mind, an NIH and Kennedy Center partnership. 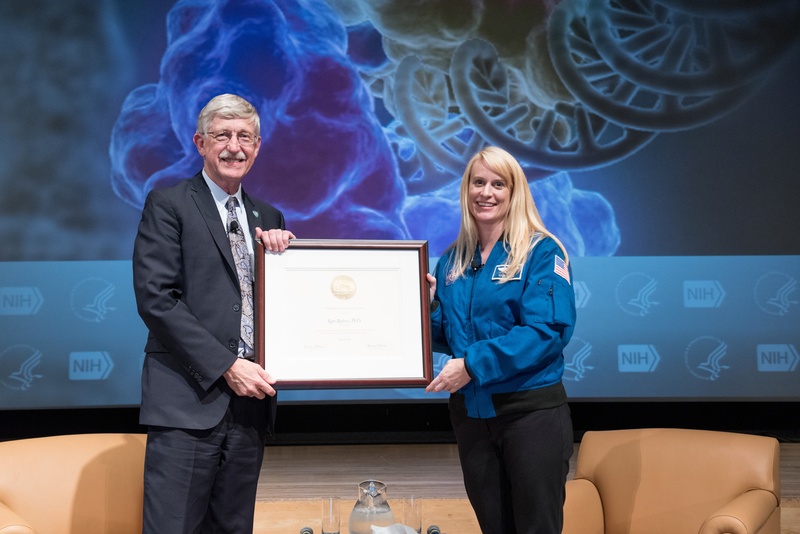 To celebrate National DNA Day 2017, NIH hosts a Facebook Live Q&A with NIH Director Dr. Francis Collins and NASA Astronaut Dr. Kate Rubins about conducting science in space. 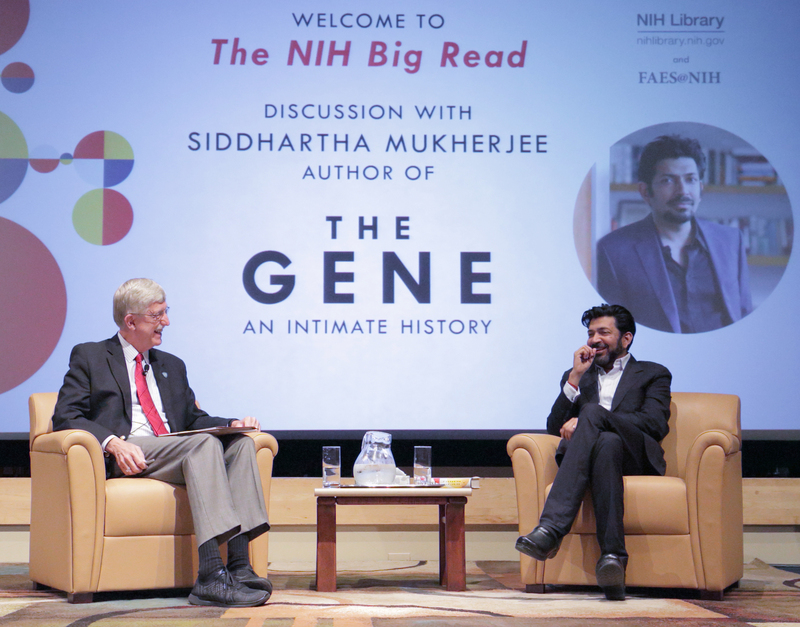 National Institutes of Health hosts Pulitzer Prize-winning author Dr. Siddhartha Mukherjee for a QA with NIH Director Dr. Francis Collins on Dr. Mukherjee’s latest book The Gene: An Intimate History. 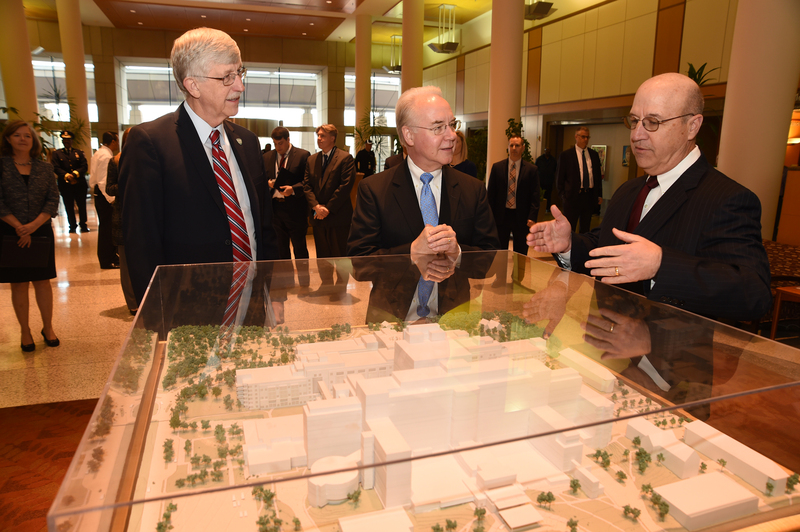 Secretary Price gets an overview of the NIH Clinical Center from NIH Director Dr. Francis Collins and NIH Clinical Center CEO Dr. James Gilman. 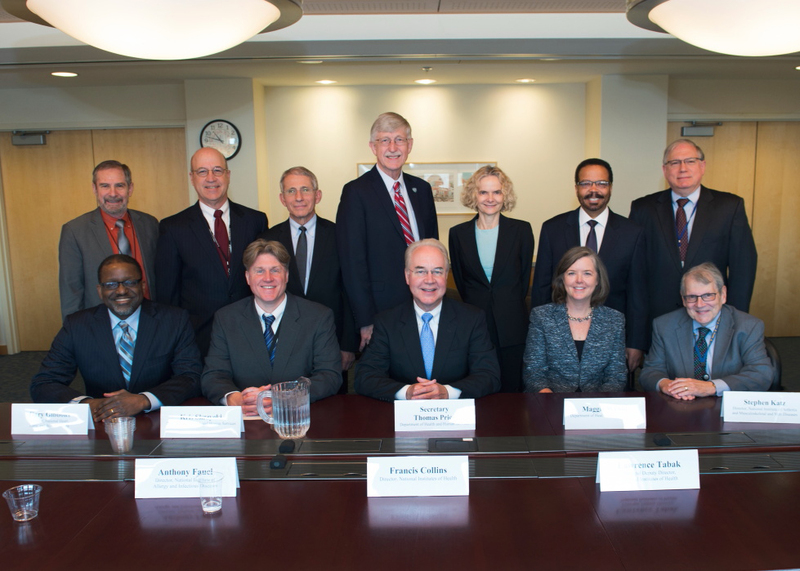 Secretary Price meets with NIH Director Dr. Francis Collins, NIH Deputy Director Dr. Lawrence Tabak, a number of NIH leaders, including Dr. Doug Lowy, Dr. James Gilman, Dr. Antony Fauci, Dr. Nora Volkow, Dr. Roderic Pettigrew, Dr. Gary Gibbons, and Dr. Stephen Katz, and Kris Skrzycki and Maggie Wynne from HHS in the NIH Clinical Center Board Room. 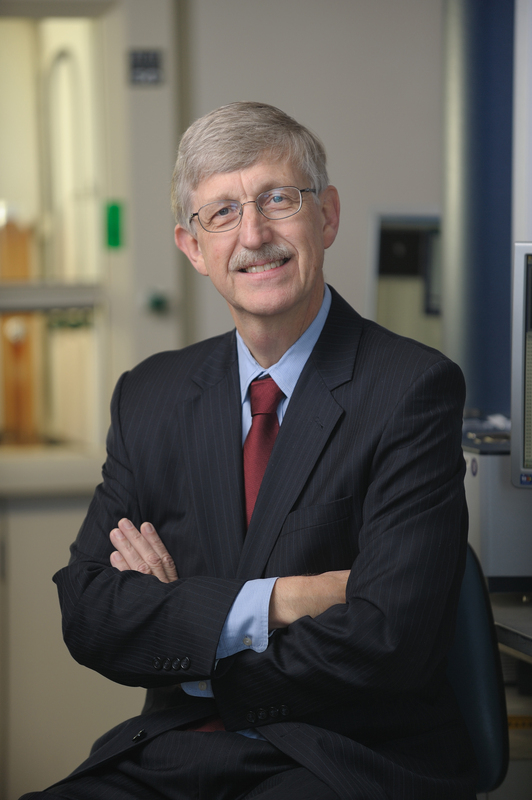 NIH Director Dr. Francis Collins leads the charge to build the Precision Medicine Initiative’s Cohort Program as he assembles the first group of NIH grantees who are tasked with helping to build the cohort. 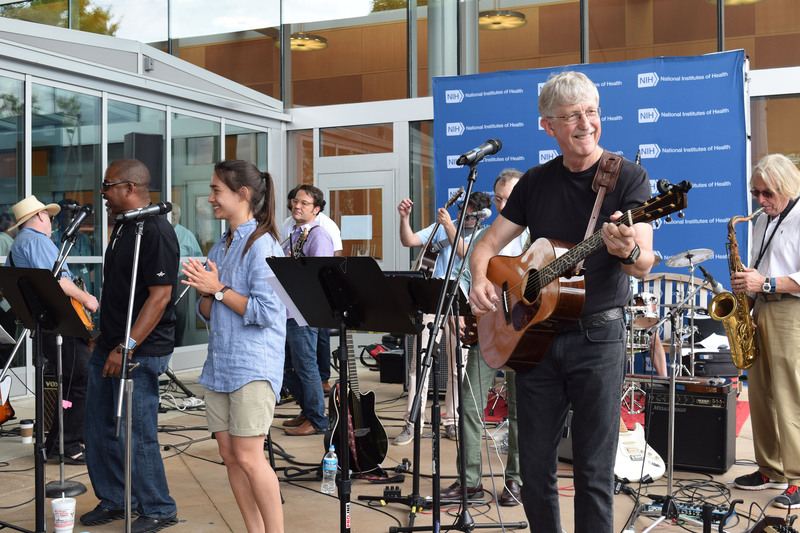 NIH Director Dr. Francis Collins performs with his band, ARRA – the Affordable Rock’n’Roll Act – for Visiting Fellows at the NIH. 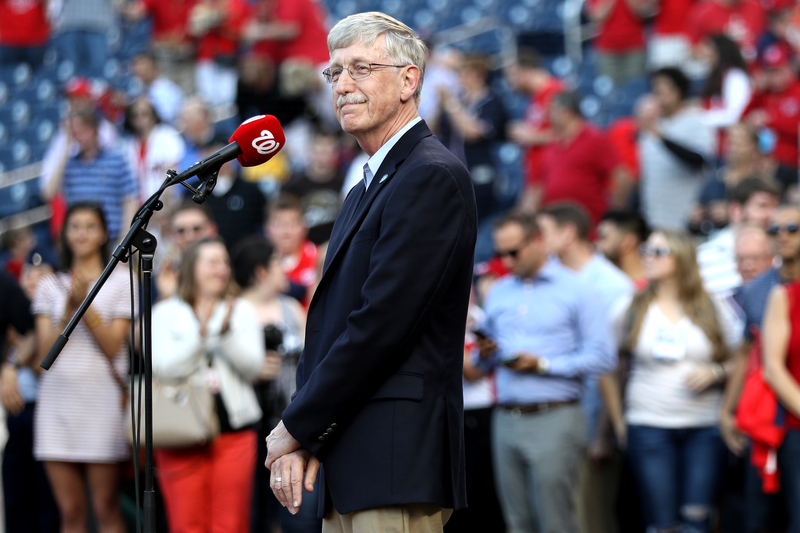 NIH Director Dr. Francis Collins sings the National Anthem at the Nationals Park in honor of Federal Workforce Day and Public Service Recognition Week. 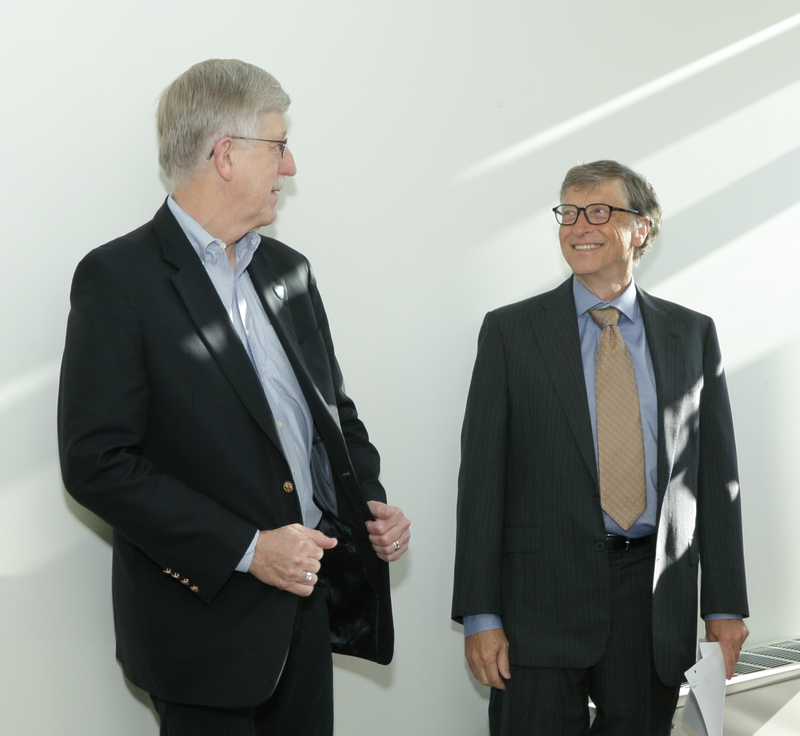 NIH Director Dr. Francis Collins and Bill Gates meet to discuss global health research and partnership opportunities. 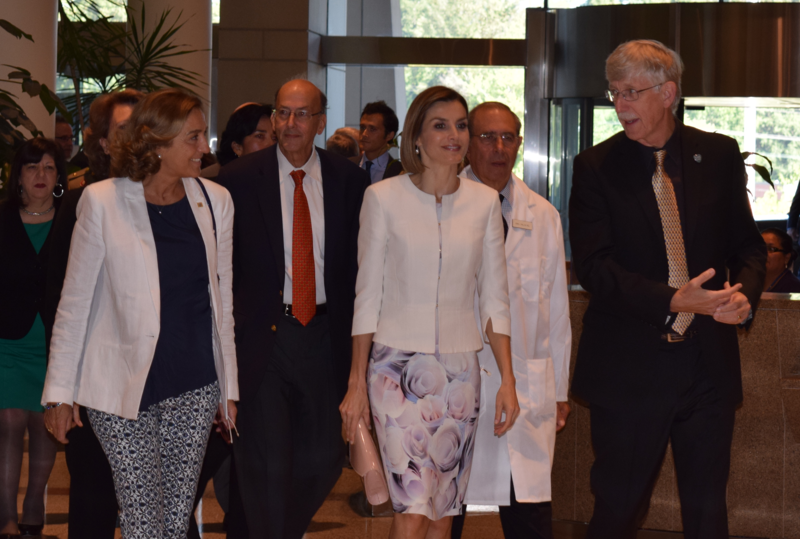 Her Majesty Queen Letizia of Spain was welcomed to the Clinical Center by NIH Director Dr. Francis Collins and Clinical Center Director Dr. John Gallin. NIH Director Dr. Francis Collins and Senior Advisor to the President Valerie Jarrett host an NIH fireside chat in the Mark O. Hatfield Clinical Research Center at the NIH. 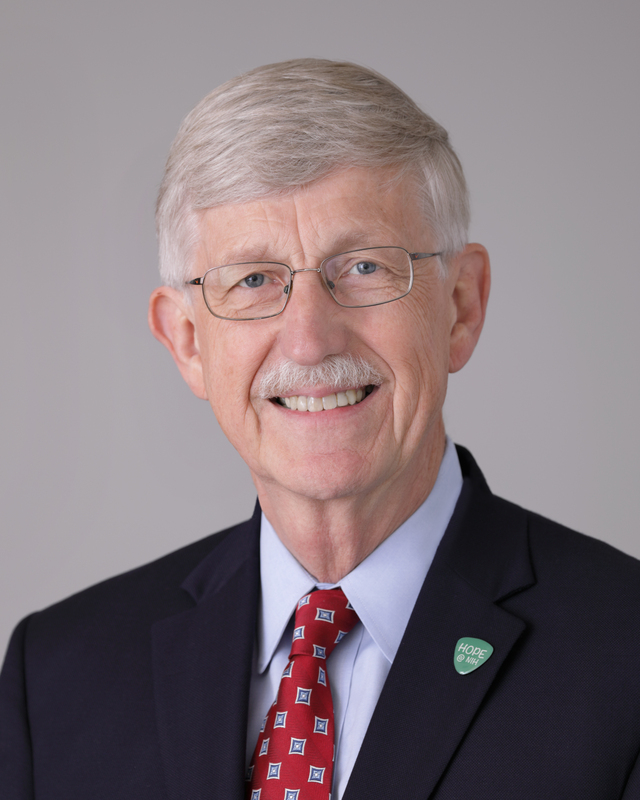 NIH Director Dr. Francis Collins and Senator Barb Mikulski tour a research facility at the National Center for Advancing Translational Sciences. 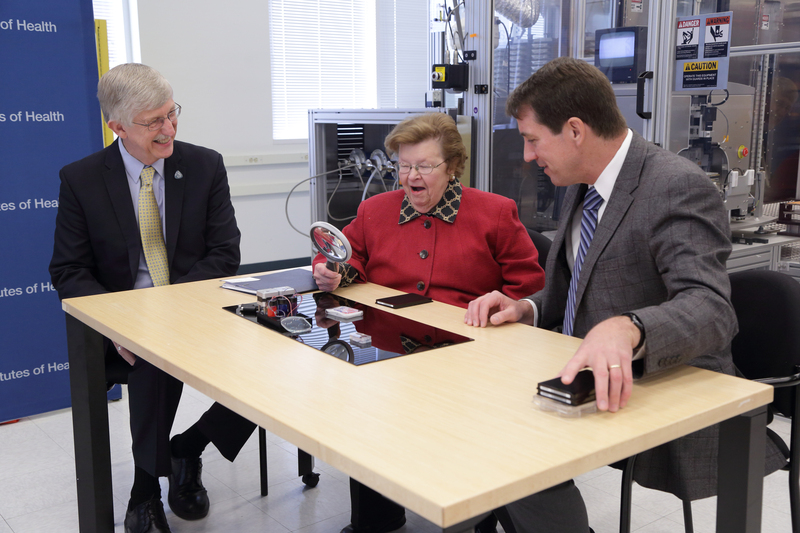 Senator Mikulski observes a high-speed robotic screening system, which analyzes thousands of chemical compounds to ascertain their effect on disease targets. 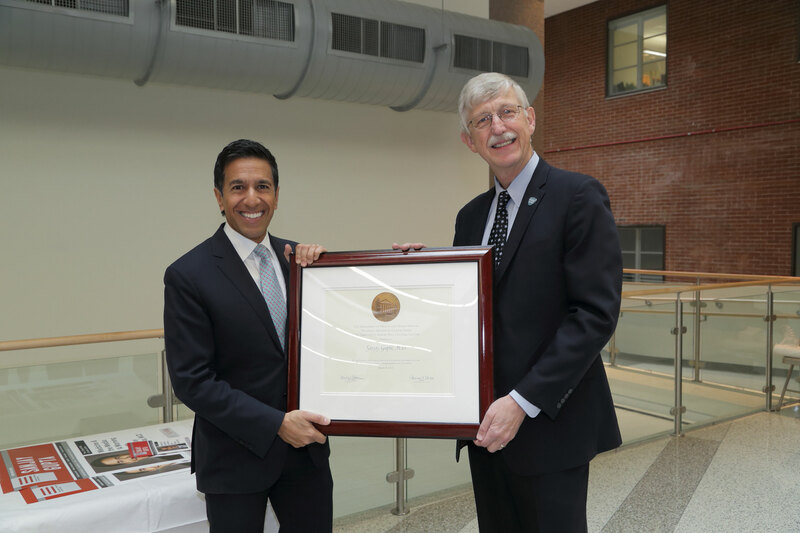 NIH Director Dr. Francis Collins and CNN Senior Medical Correspondent Sanjay Gupta speak about the intersection of science and the media during the NIH’s Annual J. Edward Rall Cultural Lecture. 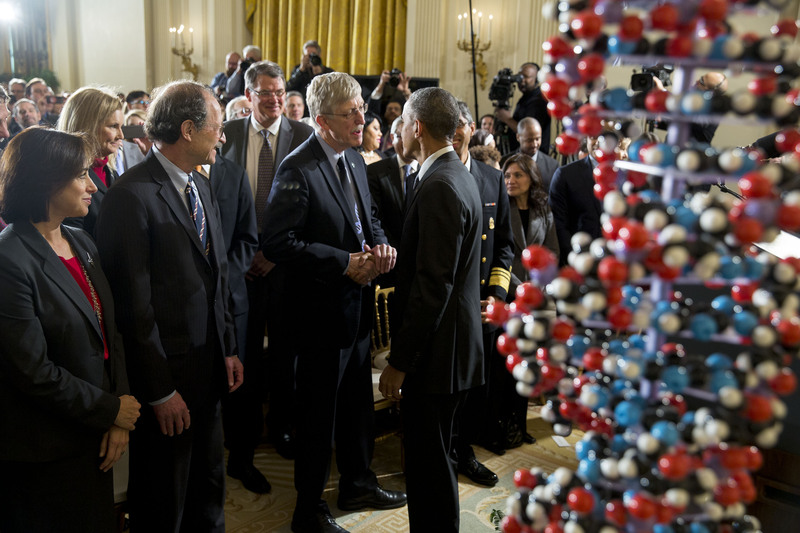 President Barack Obama speaks with NIH Director Dr. Francis Collins following remarks highlighting investments to improve health and treat disease through precision medicine, in the East Room of the White House with Dr. Harold Varmus and Dr. Karen DeSalvo in the foreground. Official White House Photo by Pete Souza. 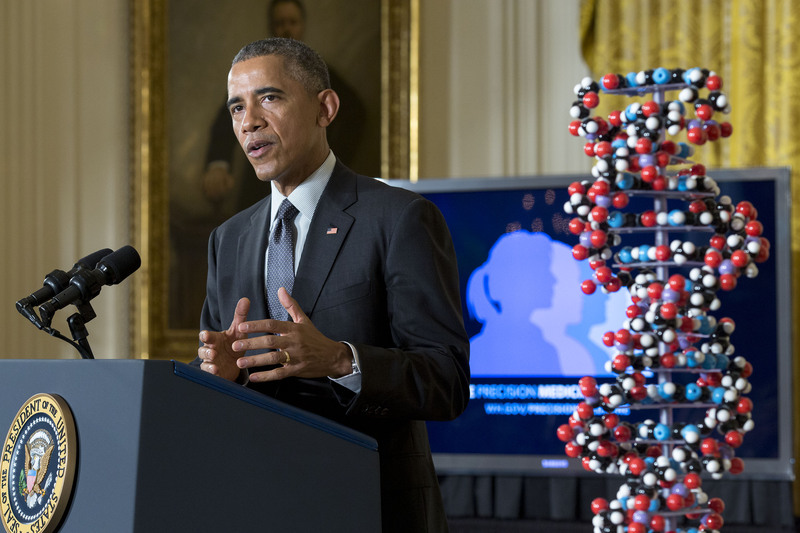 In the East Room of the White House, President Obama announces the launch of the Precision Medicine Initiative, a bold new enterprise to revolutionize medicine and generate the scientific evidence needed to move the concept of precision medicine into every day clinical practice. 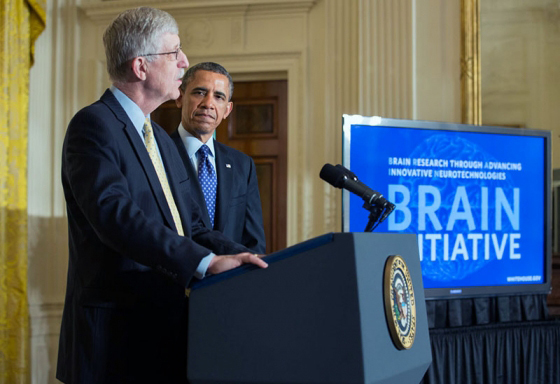 President Obama spoke to NIH staff about how proud he was of the progress that biomedical research is making against Ebola virus disease and the importance of keeping the momentum going for an Ebola vaccine and treatment. 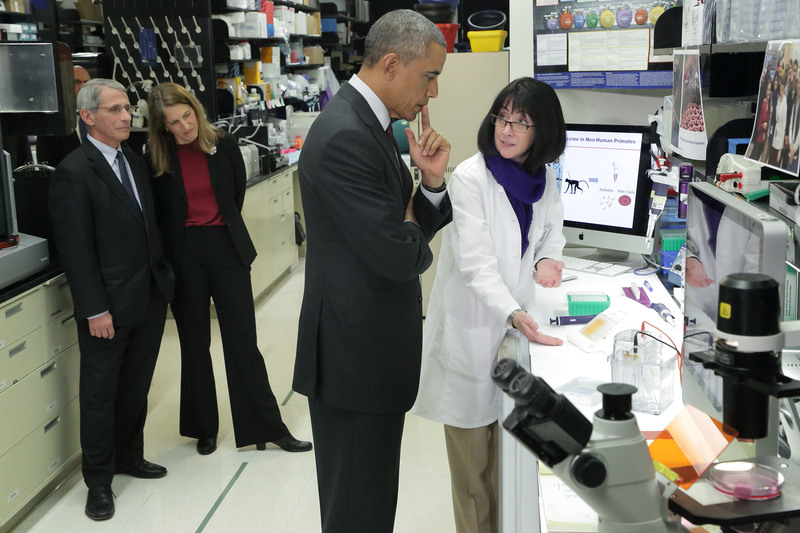 President Obama tours the National Institute of Allergy and Infectious Diseases (NIAID) Vaccine Research Center. 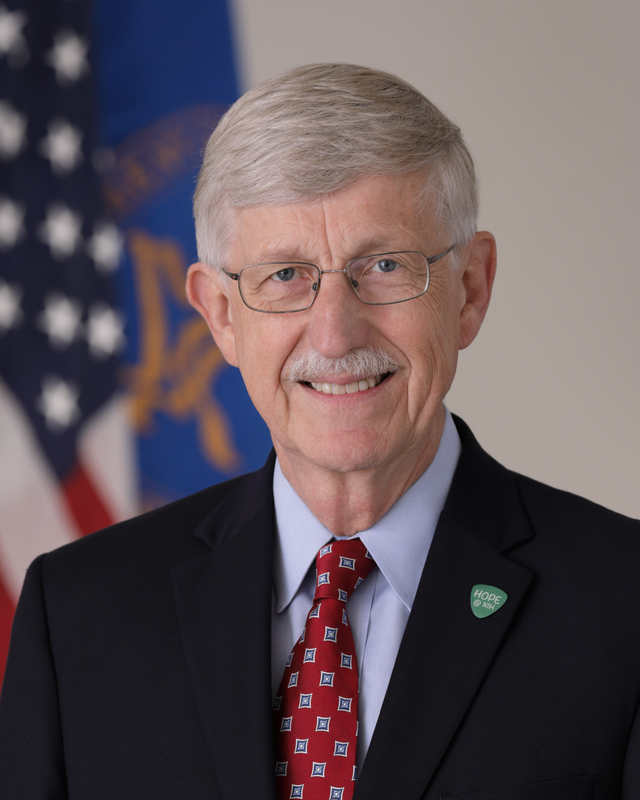 He is joined by NIH Director Dr. Francis Collins, NIAID Director Dr. Anthony Fauci, and Dr. Nancy Sullivan, Chief of NIAID’s Vaccine Research Center’s Biodefense Research Section. President Barack Obama learns about the results of the experimental Ebola vaccine, which just completed Phase 1 clinical trials, from Dr. Nancy Sullivan, Chief of the National Institute of Allergy and Infectious Diseases Vaccine Research Center Biodefense Research Section. 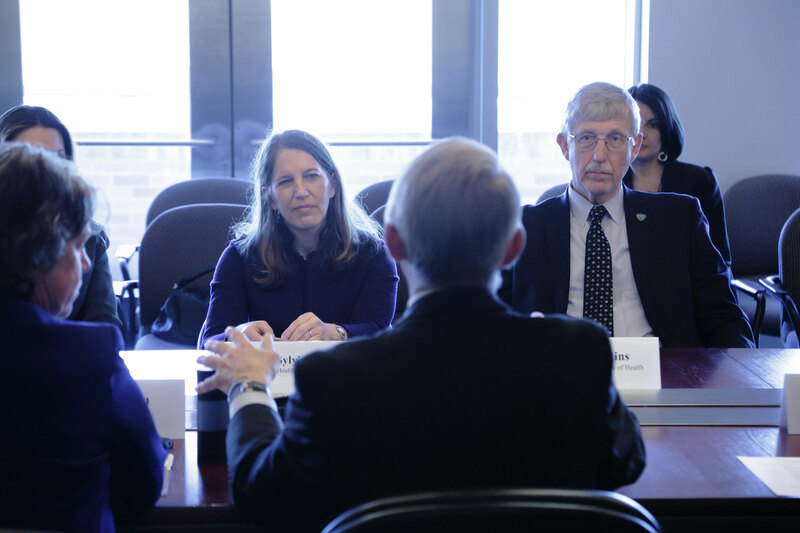 HHS Secretary Sylvia Burwell and NIAID Director Dr. Anthony Fauci accompanied the tour. 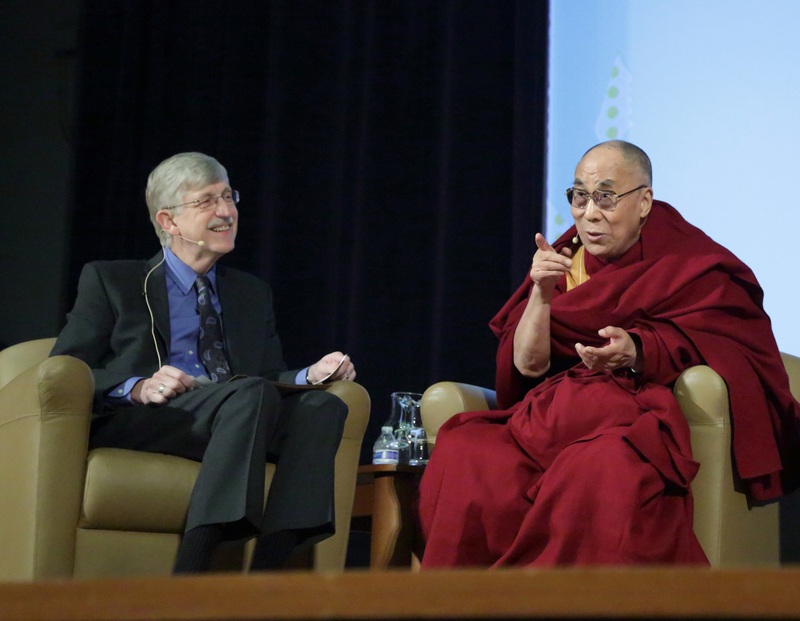 NIH Director Dr. Francis Collins and His Holiness the Dalai Lama speak on “The Role of Science in Human Flourishing” during the annual J. Edward Rall Cultural Lecture at the NIH. 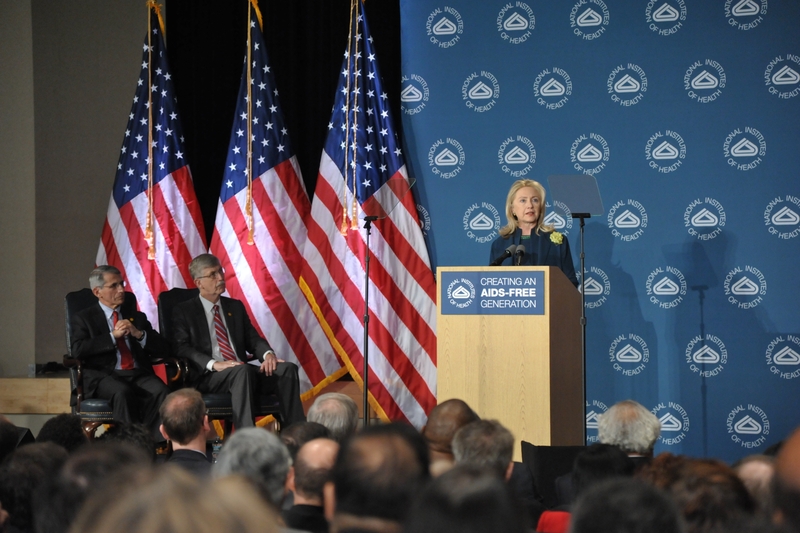 Former Secretary of State Hillary Clinton delivers a speech about HIV/AIDS at the National Institutes of Health, November 2011. 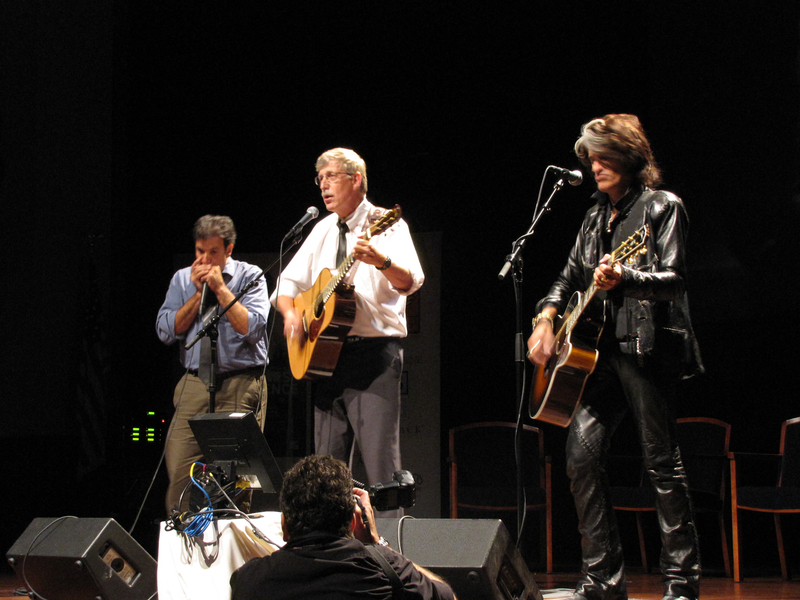 NIH Director Dr. Francis Collins, immediate left, and NIAID Director Dr. Anthony Fauci, far left, joined her on the stage. 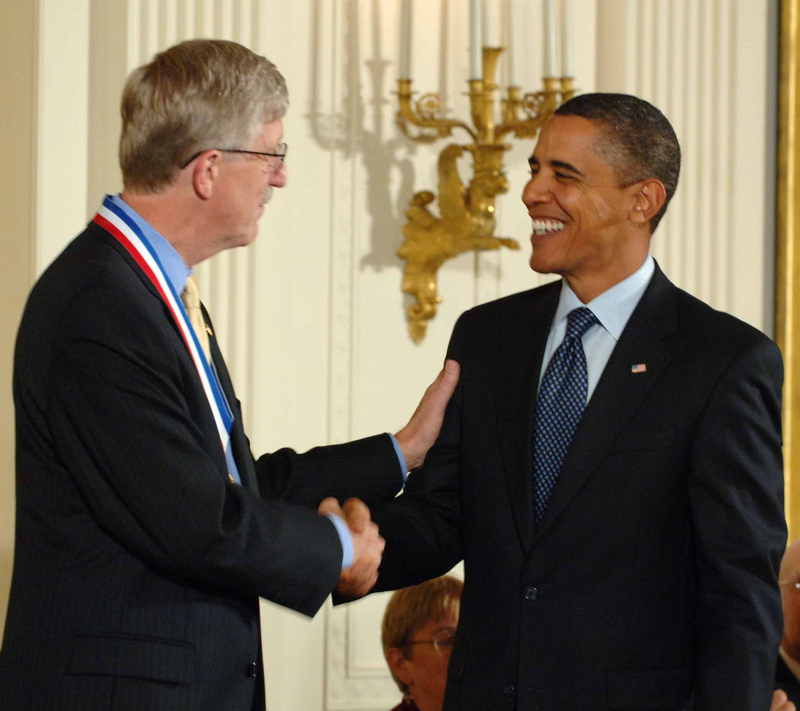 NIH Director Dr. Francis Collins presides over the NIH’s annual Presidential Early Career Award for Scientists and Engineers Ceremony. 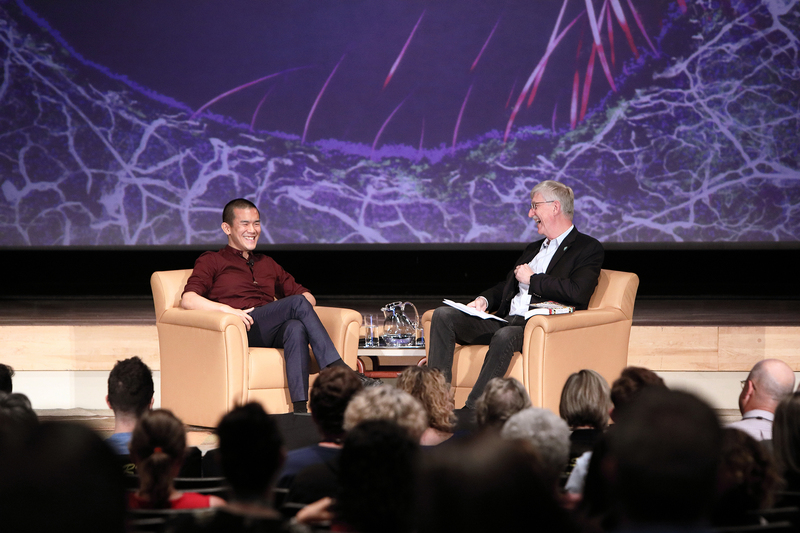 This award is given to honor and support the extraordinary achievements of young professionals at the outset of their independent research careers in the fields of science and technology. 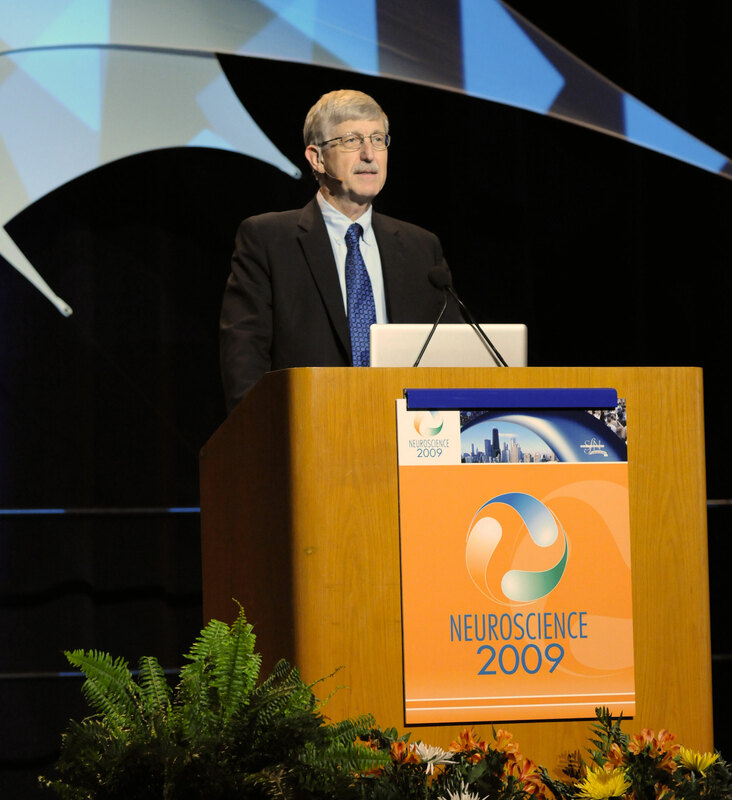 At the Society for Neuroscience annual meeting in Chicago, Dr. Collins discusses his vision and the key challenges and opportunities facing NIH and the broader scientific community. 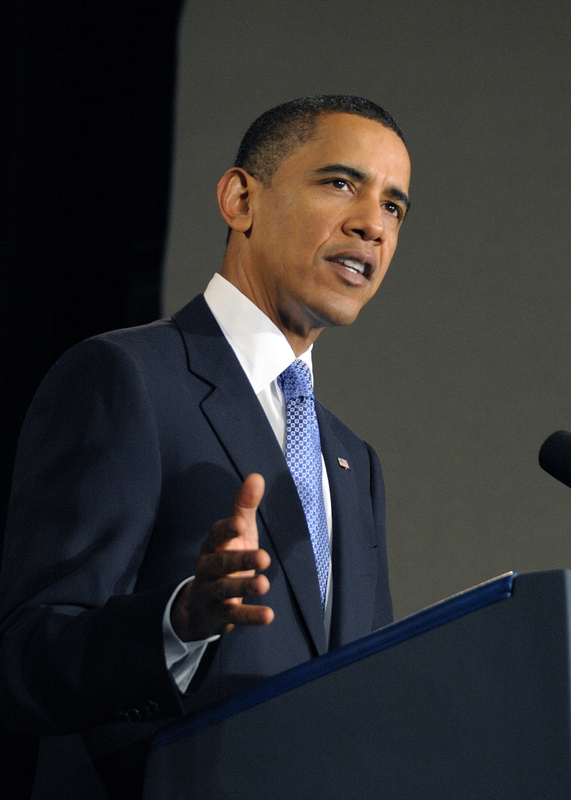 President Barack Obama thanks NIH employees for their ARRA-related efforts. 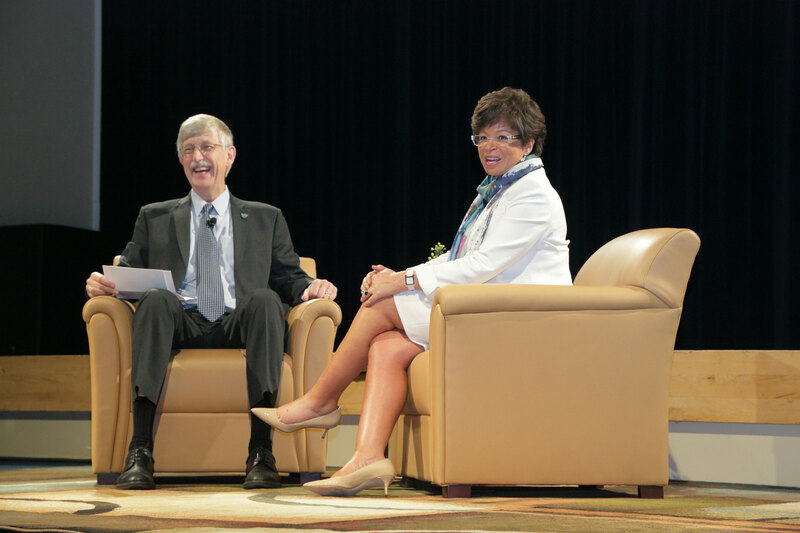 On stage with him in the Mark O. Hatfield Clinical Research Center at the NIH are HHS Secretary Kathleen Sebelius and NIH Director Dr. Francis Collins. 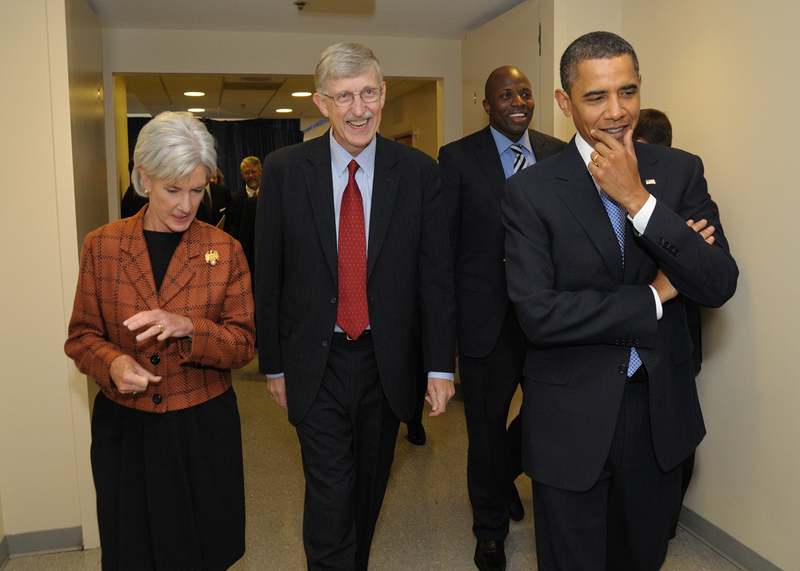 President Barack Obama (right) gets an update on NIH activities from NIH Director Dr. Francis Collins (third from left). 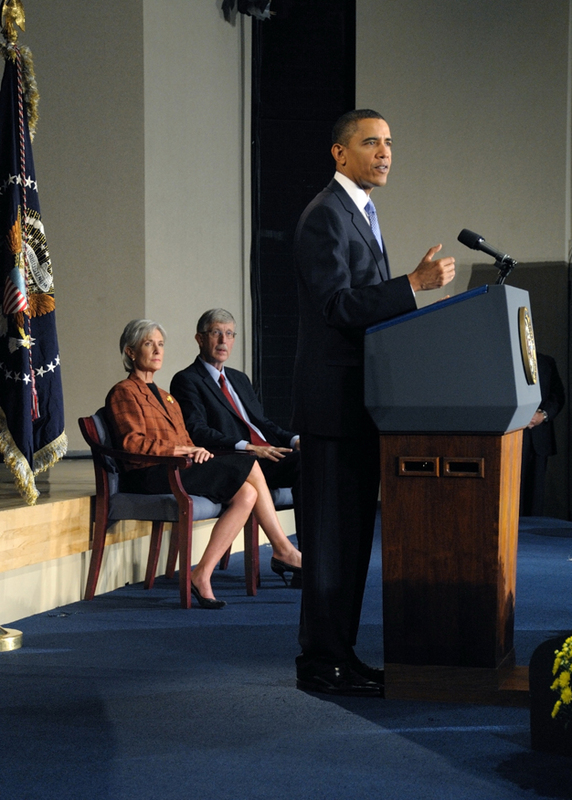 Also on hand are (from left) Bill Corr, Deputy HHS Secretary; HHS Secretary Kathleen Sebelius and Dr. John Holdren, the President's science advisor. 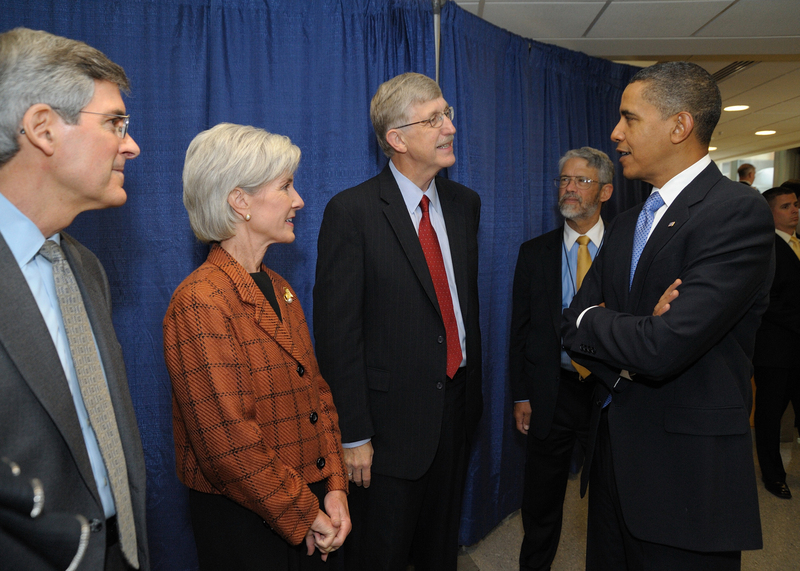 From left, HHS Secretary Kathleen Sebelius, NIH Director Dr. Francis Collins and President Barack Obama tour the Mark O. Hatfield Clinical Research Center at NIH. 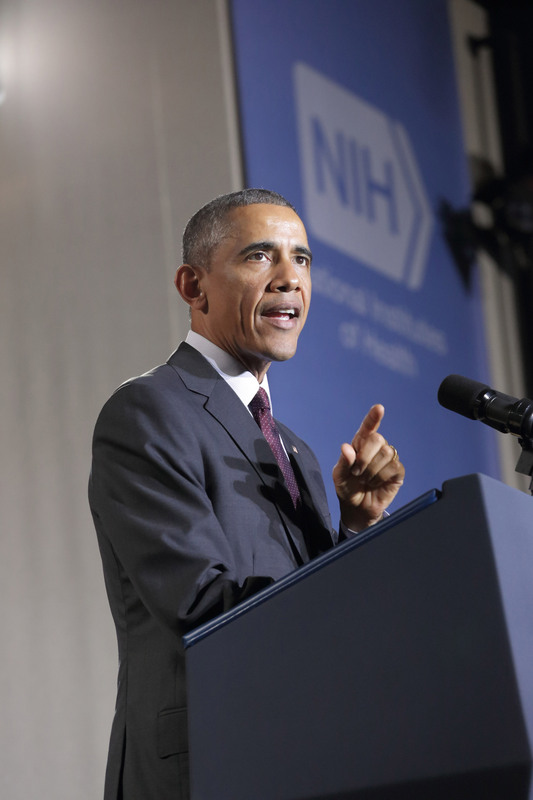 President Barack Obama addresses NIH employees in Masur Auditorium in the Mark O. Hatfield Clinical Research Center at the NIH. He thanked more than 450 assembled workers for their extraordinary effort in distributing $5 billion in grants made possible by the American Recovery and Reinvestment Act. 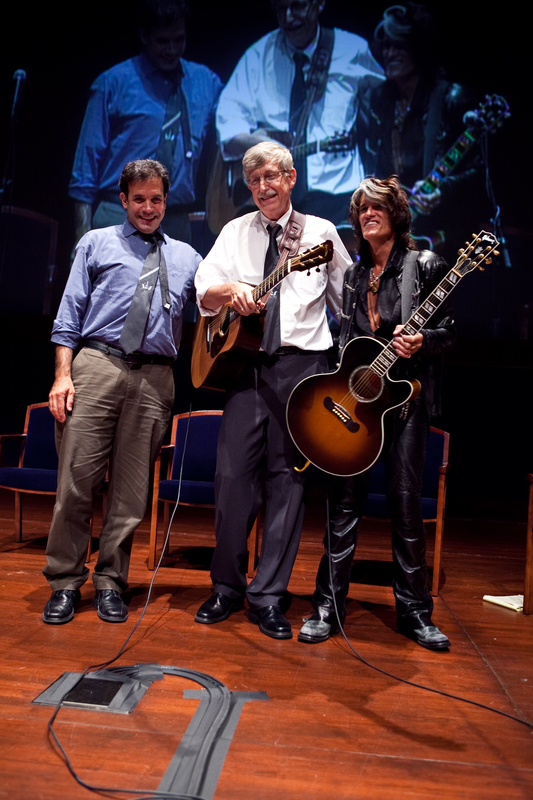 NIH Director Francis Collins performs live on Capitol Hill with Aerosmith's Joe Perry as part of the “Rock Stars of Science" campaign, a program of the Geoffrey Beene Foundation. Joining them onstage is NIH grantee Rudy Tanzi, Ph.D. of Harvard. 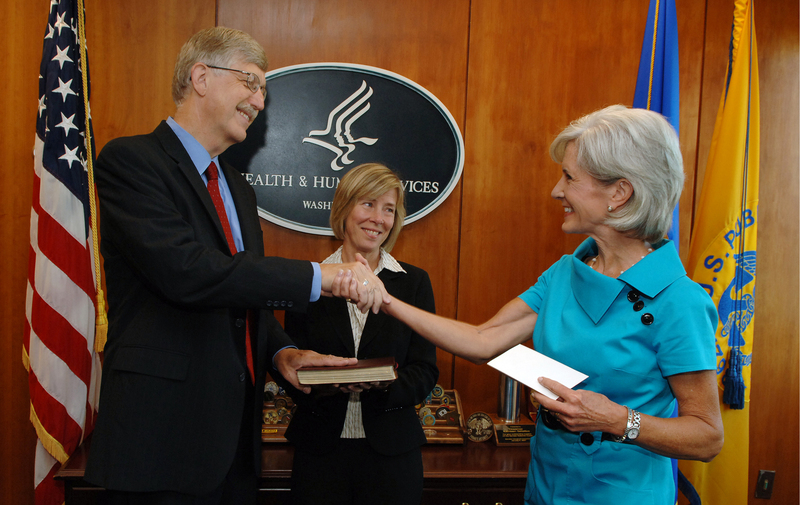 NIH Director Francis Collins and HHS Secretary Kathleen Sebelius shaking hands after he is sworn in with his wife, Diane Baker, looking on.